Commercial Director Handysize up to Post Panamax. Carlos Pena has over 15 years of experience in shipping accross various areas and has been with CTM since it was acquired by DryLog in 2004. At CTM he has the role of Commercial Director for Handymax up Post-Panamax bulk carriers and oversees the chartering operations for the Panamax and Supramax Revenue Sharing Agreements. 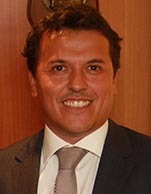 At CTM he started out in Handymax chartering employed under a joint venture called DBCN (DryLog, Bocimar, CSAV and Nomikos) and in 2010 became head of CTM's minor bulk activities. Prior to joining CTM, Carlos was employed with Compania Sudamericana de Vapores (CSAV) in Santiago, Chile, one of the largest shipping lines globally, where he was responsible for the container liner traffic sales teams in the Americas. He was also responsible for budgeting and controlling vessel actual results of CSAV's services. At CSAV he also worked in the Car Carrier department where he oversaw domestic clients and the company's joint ventures with major Japanese carriers. Carlos holds a degree in Civil Engineering from the Pontificia Universidad Cat�lica de Valpariso, Chile.